(K-PAR) Archimedia has been succeeded by MagnaStor. While MagnaStor and Archimedia are fundamentally different, MagnaStor should replace all existing Archimedia installations. MagnaStor provides support for all new versions of Windows from Windows Vista to Windows 8. Lower cost per GB compared to Archimedia. Requires no special hardware or additional media. Provides quick and immediate access to all your data. Archimedia stores data using optical and mageto-optical technology. All optical technology that Archimedia uses for storage has reached end-of-life, and as a result vendors no longer offer support or replacements should your existing hardware fail. All versions of Windows that Archimedia runs on have reached their end of support dates as well. These versions of Windows will no longer be updated and pose security risks on your network. MagnaStor is a new, evolving product with a lower cost, better integration, increased flexibility, and better compatibility with new software. Archimedia is no longer being supported or updated. 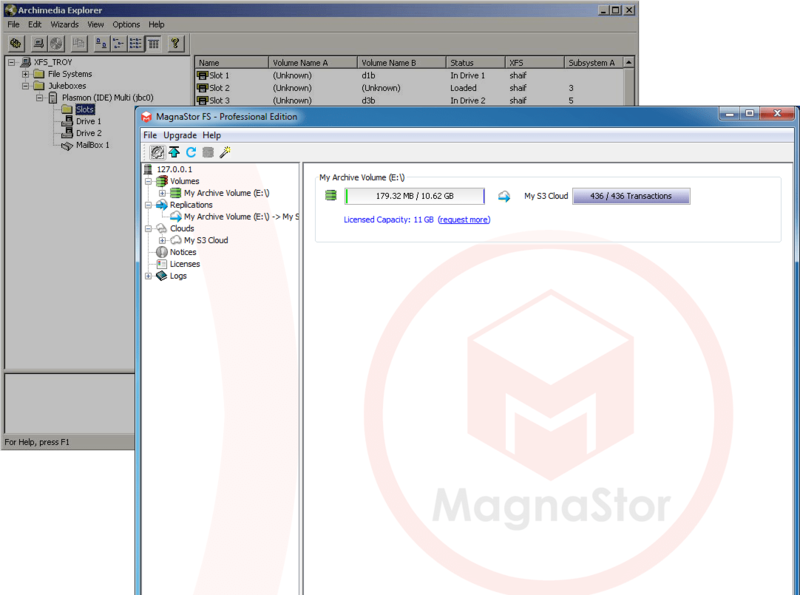 MagnaStor is a file system that is used to format common storage devices like hard drives, SSDs, and USB drives. Once formatted, these devices have the data preservation characteristics of optical media with the flexibility and ease-of-use of common storage devices. With MagnaStor you can replicate your volumes, in near-real-time, to Amazon S3 nodes all over the world (Glacier support coming Q4 2012). Contact us to learn how to easily move from Archimedia to MagnaStor and learn more about all of the benefits that MagnaStor can provide to your environment. You can download MagnaStor right now. There is no charge for the first 5GB of capacity, so you can start archiving your data right away.